Dear U.S. Immigration Legal Advisors..
Toy and I are very happy with your personal and professional handling of the K1 & K2 fiancee and child visa process. The shortest possible time frame was achieved. There were no surprises. The fee was without a doubt worth every penny. 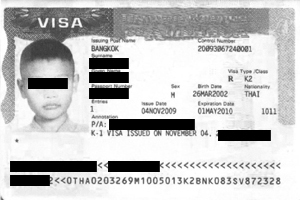 It is easy to see why your firm represents such a large percentage of Thai / USA visa applicants. The process even under the best of “no mistake” circumstances is very long. It seems even longer when you are in love and 1/2 a world apart. To have problems that can cause major delays or rejection just were not an option. I guess the best recommendation is that I want to handle the application to adjust Toy and her 4 year old daughter’s status to permanent resident as required after the marriage. Thank you for your excellent service.